Yeah, but: Short-term testing only so far. 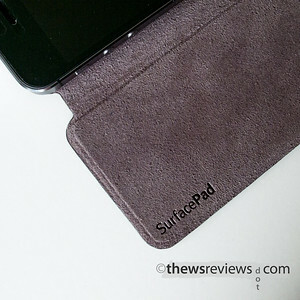 The Long Version: Despite sounding like some horror-movie hybrid of Apple and Microsoft tablets, 'SurfacePad' is actually Twelve South's name for a family of thin leather covers. 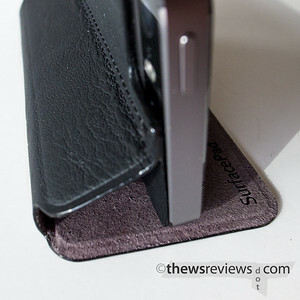 The iPhone variant wraps around the phone folio-style, using an adhesive to attach to the back of the phone to keep its bulk to an absolute minimum. Twelve South emphasizes that the SurfacePad isn't an iPhone case, and it's really not: only those looking for sleekness should consider it. The folio cover protects the screen and provides better grip on the phone, while its minimal bulk keeps it very pocketable. This is unquestionably the case that I'd want to have for a first date or while wearing a suit, but it won't compete with an Otterbox in a drop test. 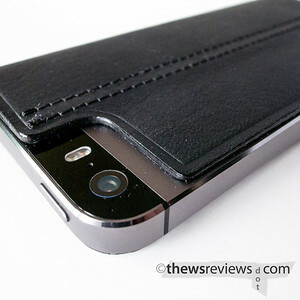 The combination of leather folio and the iPhone's metal edges looks and feels fantastic. The fit of the non-case, when positioned correctly, is perfect. The front is stiff to protect the screen and the side supple enough that the volume buttons can be felt and pressed with the cover closed. Its thinness also means that there's minimal bulk when the folio is doubled back on itself, so it can actually be used when talking on the phone, which is a weakness for their BookBook. And of course its design makes it easy to quickly check the phone and put it away again, which its aesthetic and spiritual competitor, the Sena Ultraslim, isn't particularly good for. 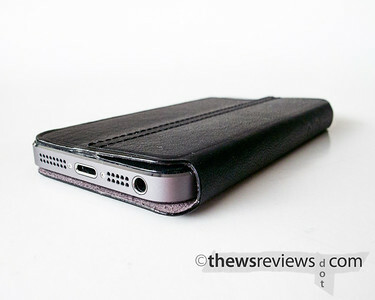 The double-row of stitching on the back adds a tactile cue for orienting the phone, and marks where the back cover hinges outward to let the folio be used as a landscape stand. I do find that its angle of repose is a little too steep, but with more use it may become less severe. It certainly has a more relaxed angle in Twelve South's product photos, which gives me a certain faith. This stand has come in handy for me a couple of times, but I wouldn't really miss this feature if it went away. The problem is that I prefer to save monogamy for the more important things in life: phone cases don't merit long-term commitments. While I enjoy having the SurfacePad for a night out or a weekend, I have two other cases that I also like to use. While the adhesive on the SurfacePad leaves no residue and has withstood multiple detachments so far, it's still something of a commitment and I have concerns about its long-term viability. A month isn't nearly long enough to actually know anything about this, but the idea of it is enough to inhibit me from switching cases as often as I like. Twelve South makes interesting products that are well thought through and cleverly designed, and the SurfacePad is no exception. I can recommend it to anyone who wants a slim cover that's easy to carry and pleasant to use, especially if it's going to be a long-term commitment.